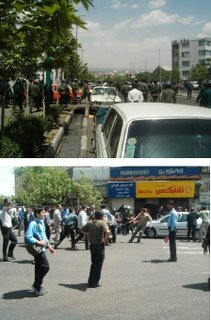 Some pictures that have reached us from the unofficial May Day rallies in Tehran. These pictures are from the rally outside the Bus Drivers' central terminal. Pictures that the BBC never shows you and protests that the BBC never reports. ... we too are fighting for true democracy in the United States ... we march in our streets and vote in our elections. How lucky you are that you have free press, can march in the streets and vote for whoever you like and say/write whatever you like againstyour politicians. We envy you! but then again all this was not handed over to you on a plate, your previous generations had to fight for it. You must be grateful to them. Our previous generation however, fucked us right up with their ignorance! Some of them you can see leaving anonymous comments here! Free press? One controlled by a handful of businessmen to promote their inteests? Voting for who you want? Remember someone called Al Gore? Oh these idiot leftists attack any one who STANDS for freedom and recently I have noticed that the Leftism mindset on human freedom is very close to that of Mullahs in Iran. By the way, can I add you to my Conservative bloggers list? Do you consider yourself a conservative/right winger in its classical essence? I like the way that you think, you are not only trying to find liberty for you and all other Iranians, you are actually DOING something about it. Many people dream of freedom, and just... dream, you write. Good work, keep it going. Viva la revolucion! Now stop regurgitating what you pick up in SWP meetings and answer my points. Winston, I consider my self someone who doesn't beat about the bush and say what I feel is the right thing to say. If I am in a room with 100 people and they all say something I consider to be wrong, I have no quarms to speak against them. "Evil Only Prevails when the Good Stay Silent". Lets not stay silent in the face of evil. cmacleods, Thank you for your kind comment. But writing is the easy part, and I hope I do more than write. good blog. when the sleeping lion (the persian people) to devour the "tazi" then we are once and for all rid of this yoke. Where in the political spectrum of left to right that fits, I don't know and I don't care. I couldn't agree more. It seems that many on the right or the left spend more time arguing about whether they (or their enemies) are more right or more left than they do discussing the real issues. Who cares? Freedom is the thing. You didn't make any points. The USA does not have a free press. How many pictures of dead soldiers are printed there? Most young Americand do not even know where Iraq is on a map according to a poll today! But we are not even talking about Socialism versus Capitalism here. 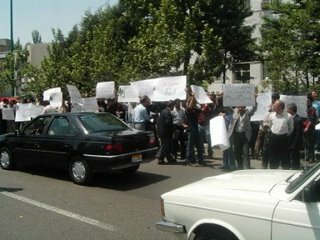 I hope in a free Iran, people can have the freedom to discuss these issues, like you have in this country. Ok so every system and every country has its faults. Look at me I love the democratic system in this country but I hate the CSA, the courts and the justice system in this country. But there is a process here which we can use to air our complaints and persuade the public to change their mind and the system. The Iran situation is much more basic than all this. We are talking about a state which tells you what to wear, what to eat, what to drink, what music to listen to, even how to piss (Mullahs for example think it is un-Islamic to stand and piss) - allow us to get the freedoms you enjoy here, then the people of Iran will learn more about Socialism from the likes of you and decide if they want it. His beloved party with many Iranian members have not had one campaign against the mullahs in Iran, in the last 27 years! Never mind. I'm sure that Hanif and the SWP will be campaigning strongly for the release of Ramin Jahanbegloo, the prominent philosopher and writer who was arrested on Wednesday. Hmm! That would be good, perhaps wishful thinking though. SWP remained quiet during the massacre of Iranian political prisoners in 1988, even though most of the victims were the Iranian Left. What chance is there for them to start a campaign for a philosopher?! When did the Leftists ever talk about the oppression of people in iraq under saddam, Iran, Syria or North Korea and even Cuba? Where is the left to care about these people?! Leftists are bunch of pathetic America haters! Leave a message on the SWP website? There is no such function! Wouldn't let you ask questions? More like wouldn't let you disrupt the meeting. There is no such function? and you say you are free press?? But you can leave your comments here. There is a function for that!